There are only 5 Platonic solids, and the simplest of the 5 is the 4-cornered (vertices), 4-faced, 4-sided shape known as the Tetrahedron. So what's the big deal, right? It looks pretty simple, so it must be uninteresting, right? I thought so, but for such a simple shape, it's actually much more interesting than it looks. Tetrahedron A tetrahedron is the most simple of three space shapes since it consists of only four vertices (see figure below). The Greek tetra stands for four, and can still be found in some science words such as tetrachloride or tetravalent. The hedra is from the Greek for base, or seat. OK, now that we know what it is, what can we do with it? What properties does it have that one may call: Interesting? For starters, check out the WolframMathWorld article on Dual Polyhedra, that is to say, if you put a plane on a polygon where a point exists, what new shape do you get, that is to say, what is its dual? As it turns out, the dual of a cube is an octagon and vice versa, and the dual of an icosahedron is a dodecahedron and vice versa, but the dual of a tetrahedron is ... another tetrahedron! What interests me about that shape is it forms six crosses, and if the outermost points are connected, they form a cube. 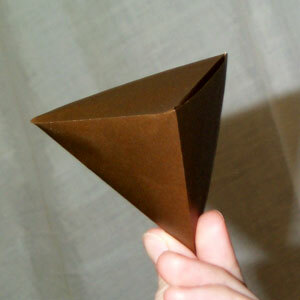 A tetrahedron is a three dimensional polytope, a polygon. A 4th-dimensional polytope is a polychoron.The 5-cell, or pentachoron, is the 4D analog of the tetrahedron. Just as the tetrahedron has four triangular faces, the pentachoron has five tetrahedral faces. Jason Hise developed that. Visit his webpage http://www.entropygames.net/index.php for more cool stuff. 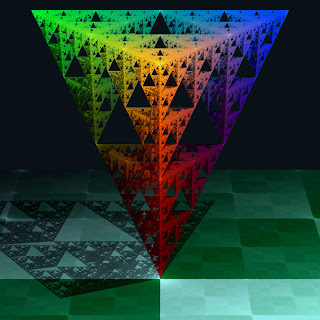 In numerical analysis, complicated three-dimensional shapes are commonly broken down into, or approximated by, a polygonal mesh of irregular tetrahedra in the process of setting up the equations for finite element analysis especially in the numerical solution of partial differential equations. These methods have wide applications in practical applications in computational fluid dynamics, aerodynamics, electromagnetic fields, civil engineering, chemical engineering, naval architecture and engineering, and related fields. The tetrahedron shape is seen in nature in covalent bonds of molecules. All sp3-hybridized atoms are surrounded by atoms lying in each corner of a tetrahedron. For instance in a methane molecule (CH4) or an ammonium ion (NH4+), four hydrogen atoms surround a central carbon or nitrogen atom with tetrahedral symmetry. For this reason, one of the leading journals in organic chemistry is called Tetrahedron. See also tetrahedral molecular geometry. The central angle between any two vertices of a perfect tetrahedron is , or approximately 109.47°). Water, H2O, also has a tetrahedral structure, with two hydrogen atoms and two lone pairs of electrons around the central oxygen atoms. Its tetrahedral symmetry is not perfect, however, because the lone pairs repel due to their negative charges. Quaternary phase diagrams in chemistry are represented graphically as tetrahedra. However, quaternary phase diagrams in communication engineering are represented graphically on a two-dimensional plane. If six equal resistors are soldered together to form a tetrahedron, then the resistance measured between any two vertices is half that of one resistor. Since silicon is the most common semiconductor used in solid-state electronics, and silicon has a valence of four, the tetrahedral shape of the four chemical bonds in silicon is a strong influence on how crystals of silicon form and what shapes they assume. Especially in roleplaying, this solid is known as a 4-sided die, one of the more common polyhedral dice, with the number rolled appearing around the bottom or on the top vertex. Some Rubik's Cube-like puzzles are tetrahedral, such as the Pyraminx and Pyramorphix. 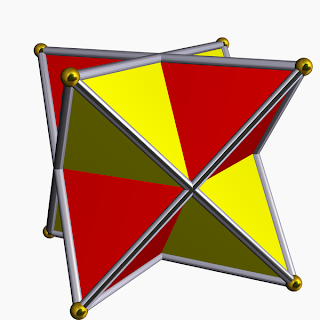 Tetrahedra are used in color space conversion algorithms specifically for cases in which the luminance axis diagonally segments the color space (e.g. RGB, CMY). The Austrian artist Martina Schettina created a tetrahedron using fluorescent lamps. It was shown at the light art biennale Austria 2010. It is used as album artwork, surrounded by black flames on The End of All Things to Come by Mudvayne. The tetrahedral hypothesis, originally published by William Lowthian Green to explain the formation of the Earth, was popular through the early 20th century. One of my favorite properties of a tetrahedron is an extension of the concurrency of the medians of a triangle. As you well know, the medians of a triangle intersect in a point and the point divides each of them in a ratio of 2 to 1. If you construct a segment from the vertex of a tetrahedron to the centroid of the opposite face, these four lines also intersect in a single point, and the point, as Archimedes knew, divides each line in a ratio of 3 to 1. So I'm guessing that something similar will happen with a simplex in four space and divide them into a four to one ratio. Thanks Pat. Believe me, this won't be the last post I make about this intriguing and seemingly simple shape. We shall return to it soon enough, as it appears deeper and richer than is first apparent. hi this type of shape has interested me for a number of years. i wasnt looking for a tetrahedron exactly, i was looking for a drawing of a rectangular prism with x's drawn through each face. any idea what this would be called? thanks. So I suppose that the ability to actually "Quantify Infinity" would seem rather impossible then? The four sided Pyramid (Tetrahedron) is a very interesting model as a means to use linear 2D mathematical processing, but in 3D mathematics?, this can take on a whole new spin all it's own.. When this form of geometrical design is used "spatially" the results are really interesting (especially in Astrophysics and quantum/string entanglement operations).. I'm writing because I have been in contact with an individual, that understands 0=Infinity (which also means zero can = 4) and has taken a prototype mechanical "physical model" I instructed them on how to build (based on 0=6) , and they now can add, subtract, multiply, and divide zero.. They said they had a dream about 0=4, and I offhanded told them that if they replace the 0=6 (cubed) model part of the design, adjust the figures by subtracting two values, and use a Tetrahedron instead (four sided pyramid) then they could still achieve the ability to add, subtract, multiply, and divide zero, while still remaining linearly constant in "repeatable" results..
As the Bible says, Joh 3:12 If I have told you earthly things and you do not believe, how shall you believe if I tell you heavenly things? The Tetrahedron was used to proof that apartheid - "rainbow" nation is the only true political system where Trinity God = Father, Son and Holy Ghost equality represent, and negate classes. When you replace the Father, Son and Holy Ghost with the Colors, Red, Green and Blue and you apply it positively, you get white light. Should you take into consideration, man is an image of God, then man equals body, mind and soul. If freeman or Republic are represented by man on equal bases or is an image of man then government equals body mind and soul, or executive, legislative and judiciary. If the three pure colors are positive or additive it will give white light as long as it is in the same intensity. If the three pure colors are negative or subtractive you get Cyan, Magenta and Yellow and the absence of light or "Hell" This explains to you Rev 13:18 Here is the wisdom. Let him having reason count the number of the beast, for it is the number of a man. And its number is six hundred and sixty-six. The penetration of one tetrahedron on another. The conflict model when the Judiciary are in conflict with the legislator - or the executive in conflict with the judiciary etc. This is the reason for 1Sa 8:6&7 But the thing displeased Samuel, when they said, Give us a king to judge us. And Samuel prayed unto the LORD. And the LORD said unto Samuel, Hearken unto the voice of the people in all that they say unto thee: for they have not rejected thee, but they have rejected me, that I should not reign over them." And "Joh 14:6 Jesus saith unto him, I am the way, the truth, and the life: no man cometh unto the Father, but by me." Also Gal 3:28 There is neither Jew nor Greek, there is neither bond nor free, there is neither male nor female: for ye are all one in Christ Jesus. So can the perfect figure 7 be explained - Trinity on Four planes. (3 +4) or the twelve nations (3x4) or Aaron's dices (4-3)=1.
" I See an Angel ! " Has Peter Woit Lost His Mind ?